Welcome to GE's triVIEWER, a giant leap forward in the display of triathlon results and analysis - and here is a brief explanation on what it is and how to use it. We are very pleased, and proud, after months of work, planning (and stress!) to be able to launch the GE's triVIEWER as an interactive addition to the extensive and legendary Tri247 results database. We do hope you enjoy using and sharing it with your friends as much as we do. Here are are a few suggestions on how to get the most out of triVIEWER, and how to find your results to re-live time and again. We have even more great functionality coming soon and we will update you on that in due course. triVIEWER is an interactive, online race results visualization system which allows you to bring triathlon results to life by 'watching' your races, and comparing and tracking your performances versus your friends, rivals, celebrities, club mates - or indeed anyone else in the race. The triVIEWER application currently has two elements. 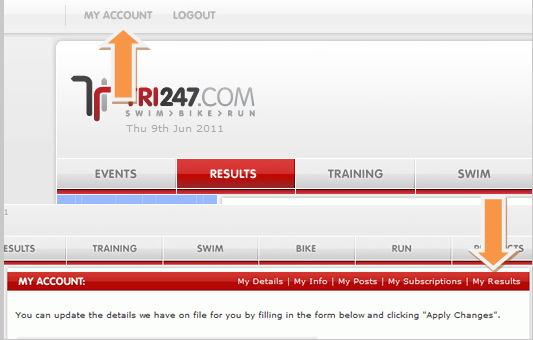 triVIEWER :this enables you to run race simulations against the full archive of Tri247 results*. We have results going back as far as 1994: re-live the Thames Turbo Sprint from 3rd July 1994 for example! 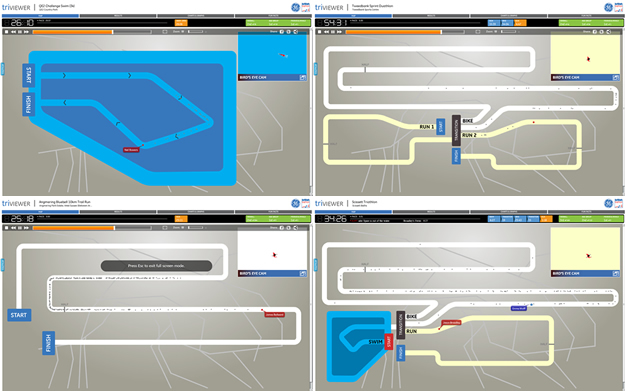 triVIEWER+ :exactly the same functionality as triVIEWER, but with the added twist of replaying your race against the actual course map! 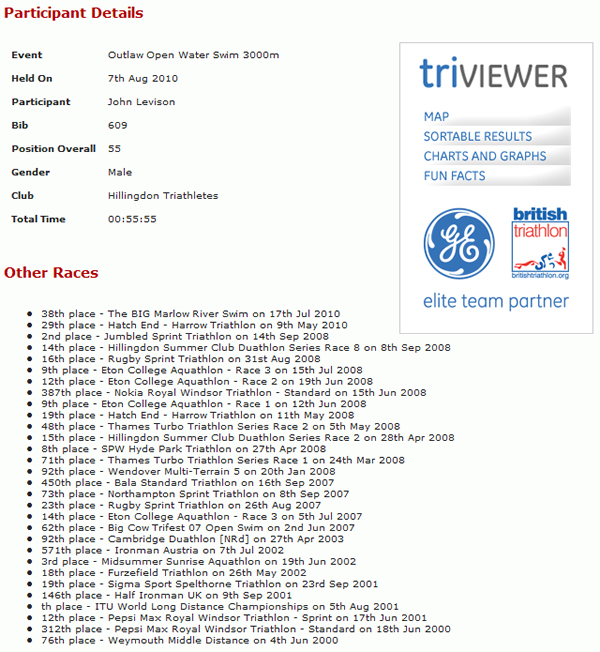 Our first triVIEWER+ is for the 2011 GE Blenheim Triathlon, but more will be added soon, and we will keep you updated on those in our dedicated triVIEWER section on the site. 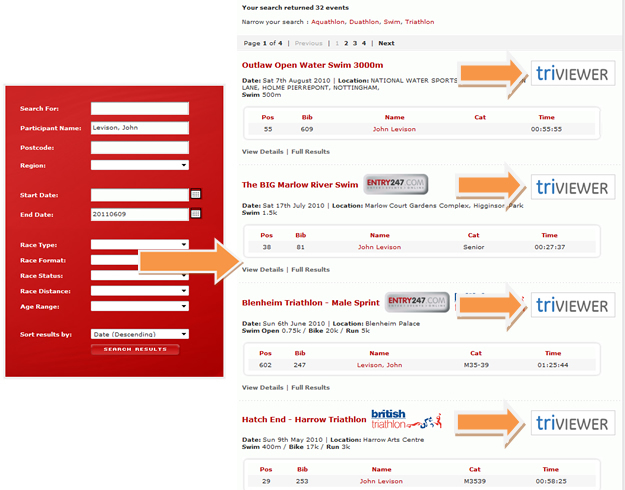 (* triVIEWER works on triathlon, duathlon, run and swim events (aquathlon will be added very soon), where we have results loaded locally to the Tri247 results database. 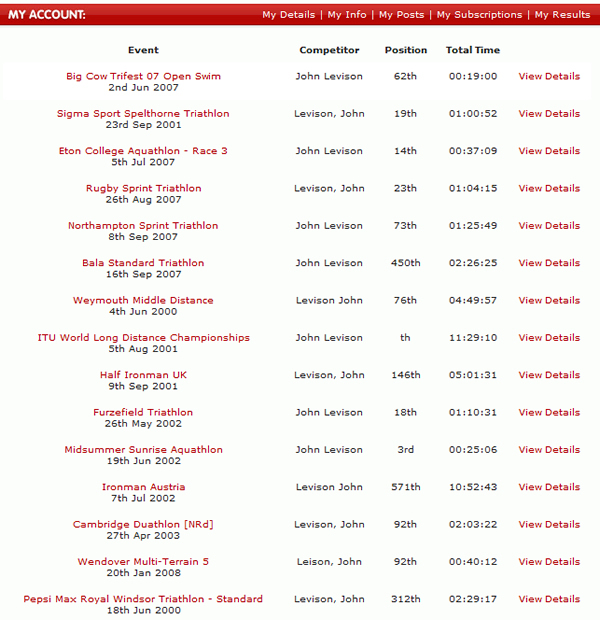 There will be a small number of events where we aren't able to offer the triVIEWER function (non standard race formats are a good example, or triathlon events without split time data), but the vast majority of the Tri247 results archive is already activated with triVIEWER functionality. We have many thousands of results with more being added every week for both the latest events and historic races as we seek to make our database even more comprehensive). How do I use triVIEWER? triVIEWER is fully integrated into the Tri247 events and results database for ease of use, but here are a few tips to get the best from it. We would always recommend when searching for results on Tri247 that the Advanced Search function is your best option. 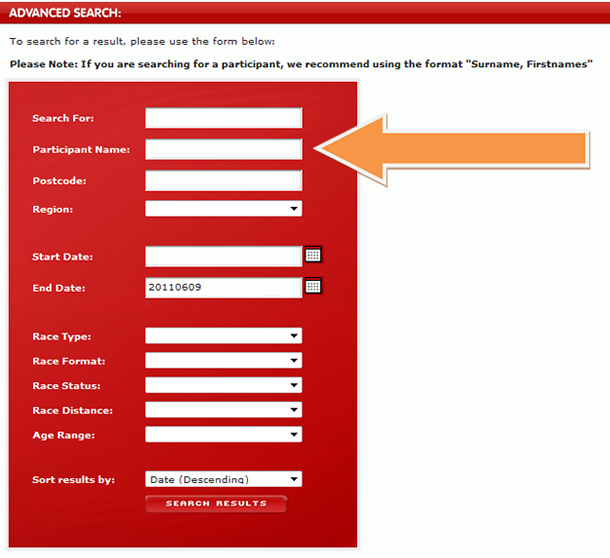 This allows you to search by race name, date, event type and more. When you have searched for a race, if the results returned have the triVIEWER icon located on the screen, then triVIEWER is available and all you need to do is click and play! Here is the REALLY useful thing! Can't remember which races you've done, or what results we might have? Well, we've added a Participant Name search function to the Advanced Search box. This is a great tool to allow you to quickly find many of your results. Try it, you might be surprised what you find! (Note; the spelling/format of names held within the Tri247 results database is totally dependent on the format that was supplied to us by organisers and events, hence not all of your results may be returned by this method. 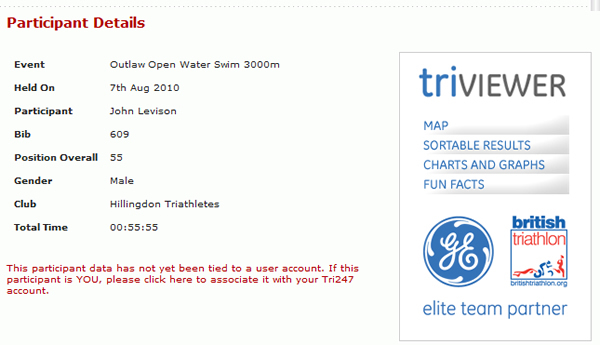 However, this search should provide a great way to very quickly find the bulk of your Tri247 results records). 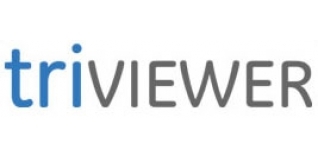 The results of this search will produce a listing of your (potential) results, and if triVIEWER is available for these then the triVIEWER graphic will be present. Here is a personal example below to prove it works. By the way, this is also a great way to check up on your competition... if you try 'Don, Tim', you'll find we have over 50 results listed for the three-time Olympian - even the glamour of the Hurst Pool Triathlon in 1998! Rather than have to search for your results each time, wouldn't it be good to be able to save them and keep a permanent record? With Tri247 you can - and this will make triVIEWER even easier for you to use. Step 1: If you haven't already, set up a (free) Tri247 account HERE. If you have an account already (or have created one in step 1), login to Tri247 at the top of the homepage with your email address and password - once you have logged in, the login box will disappear, and you will see a 'MY ACCOUNT' button as below. You can then see all of your claimed results, and click through the 'View Details' link and run triVIEWER (if it's available for that race). So there you have it, in the words of the meerkats - Simples! If you get stuck, get in touch with us via the Contact Us button, and we'll try to resolve any issues. As you can imagine, trying to retro-fit an application across a database of many thousands of races over the past 15 years and millions of participant records is extremely difficult, and we've no doubt there will be a few 'oddities' floating around, so do let us know if something isn't working. For now though, have a play and please do enjoy triVIEWER - because we certainly are.